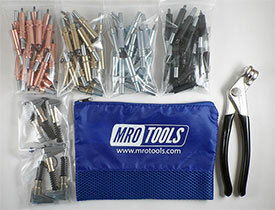 MRO TOOLS K1MSTR Cleco Fastener Set offers incredible value. Cleco Fasteners are widely used in automotive, racing, and aircraft sheet metal repair. Cleco Fasteners are spring-loaded and steel bodied fasteners that are designed to temporarily fasten multiple sheets of material together before the pieces are permanently joined and are a simple and inexpensive alternative to competitive fasteners. Cleco Fasteners are available in various lengths and strengths to accommodate different processes. MRO TOOLS Cleco Kit of 100 standard (K1/8) 0-1/4'' grip plier operated Cleco fasteners plus Cleco Pliers. The plier-operated (K) series sheet holder clamp is the standard temporary fastener solution. MRO TOOLS Standard (K-1/8) 0-1/4'' grip plier operated Cleco fastener 500 piece Cleco Kit. The plier-operated (K) series sheet holder clamp is the standard temporary fastener solution. MRO TOOLS Standard (K-3/16) 0-1/4'' grip plier operated Cleco fastener 500 piece Cleco Kit. The plier-operated (K) series sheet holder clamp is the standard temporary fastener solution. MRO TOOLS Standard (K-3/32) 0-1/4'' grip plier operated Cleco fastener 500 piece Cleco Kit. The plier-operated (K) series sheet holder clamp is the standard temporary fastener solution. MRO TOOLS Standard (K-5/32) 0-1/4'' grip plier operated Cleco fastener 500 piece Cleco Kit. The plier-operated (K) series sheet holder clamp is the standard temporary fastener solution. MRO TOOLS Standard (K-3/16) 0-1/4'' grip plier operated Cleco fastener 1000 piece Cleco Kit. The plier-operated (K) series sheet holder clamp is the standard temporary fastener solution. MRO TOOLS Standard (K-3/32) 0-1/4'' grip plier operated Cleco fastener 1000 piece Cleco Kit. The plier-operated (K) series sheet holder clamp is the standard temporary fastener solution. MRO TOOLS Standard (K-5/32) 0-1/4'' grip plier operated Cleco fastener 1000 piece Cleco Kit. The plier-operated (K) series sheet holder clamp is the standard temporary fastener solution. The MRO TOOLS K2MSTR K-Series Deluxe Cleco Sheet Metal Fastener Kit is one of thousands of quality tooling products available from MRO Tools. Please browse Cleco Fastener Kits for tools similar to the MRO TOOLS K2MSTR K-Series Deluxe Cleco Sheet Metal Fastener Kit. MRO TOOLS K2MSTR K-Series Deluxe Cleco Sheet Metal Fastener Kit description summary: MRO TOOLS K-Series Deluxe Cleco Sheet Metal Fastener Kit contains: 20 each: K3/32, K1/8, K5/32, K3/16; 3 each: KSG3/4x1/2, KSG3/4x1; 1 each: K200CG Cleco Pliers Quantity discounts may be available for the MRO TOOLS K2MSTR K-Series Deluxe Cleco Sheet Metal Fastener Kit. Please contact MRO Tools for details.